US 37 mm anti-tank gun. 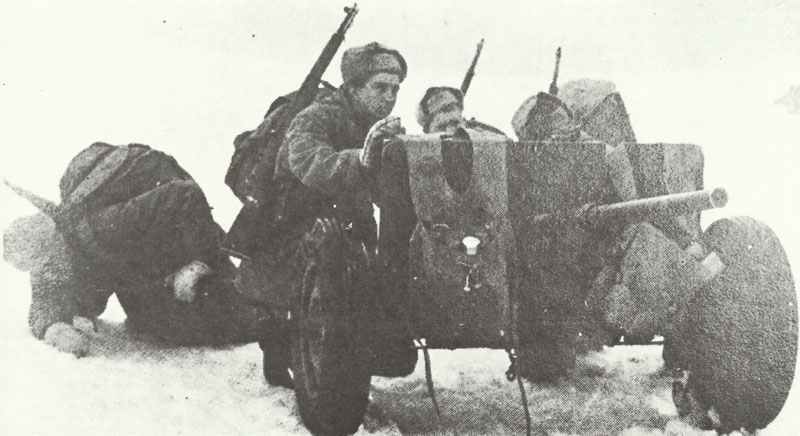 On frozen ground it was necessary for the gunners to lie across the trail legs of the 37mm gun M3 to prevent it sliding backwards when fired. During World War One the US Army adopted a 37mm French gun as a trench cannon and anti-tank weapon. As time went on its performance fell behind in the race, until it became necessary to produce something better. The 37mm M3 gun was designed shortly before the war, being frankly based on the successful German PAK 36 design. The weapon was quite conventional, having a split-trail two-wheeled carriage with small shield, but the breech was entirely hand-operated; semi-automatic operation was much more the rule in anti-tank weapons, and its omission here is quite inexplicable. In spite of this, a skilled detachment could reach a rate of fire of some 20 rounds a minute. In order to stability of the weapon in action, firing segments were attached to the axle; these were lowered to the ground and the gun pulled across them so that the wheels were lifted from contact with the ground and the gun was then supported on the segments and the trail-end spades. While theoretically sound, these devices – popular in American design circles at that time – merely add complication and work, and study of a number of photographs of the gun in action show that the segments were rarely used. The principal employment of the 37mm gun was in the Pacific theater of war. By the time the United States entered the war the 37mm was outmatched by the tanks it would have met in Europe; but the Japanese tanks were smaller and vulnerable to the 37mm throughout the war, so that it retained its usefulness. An interesting point was the provision of case shot for this gun, a shotgun-like round filled with lead balls for close-range anti-personnel firing. It was also found to be an excellent method of clearing away jungle foliage and undergrowth to clear fields of fire and flush out snipers. A vulnerable looking US 37mm M3 anti-tank gun in the opening stage of the Kasserine battle in 1943. The performance of the gun against the veteran Afrika Korps armour was disatrous and it was soon withdrawn from the European theatre. The US 37mm anti-tank gun M3 in firing position. 3d model of 37mm gun M3.